The Recipe to Ambleton Delight: Tip #1: Use what you’ve got, not what you’ve not. 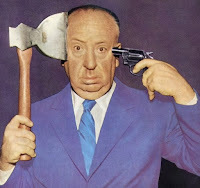 Alfred Hitchcock once said: ‘To make a great film you need three things - the script, the script and the script.’ There is no denying that a good story is a vital ingredient –something that will justify the lost friends, new enemies, general poverty and multiple near death experiences! But what may not be so obvious is that in the world of next-to-nothing film making, it’s at this stage that you can make or break your film. And we’re not talking about finding a lucrative market or commercial viability (although this is important, at this stage we will look at filmmaking as what it rightfully is: artistic expression). As the script develops, you need to weigh every scene, every character, every prop and almost every word as costing you money you don’t have. This starts with the genre. Generally speaking the most expensive films are fantasy, science fiction, disaster and costume dramas. With all the sets, costumes and special effects, it’s not hard to guess why. Low-budget films tend to be human dramas, comedies and the most prolific of all –horror. It’s not only the costs involved, but the feasibility. Horror is cheap and very easy to film, especially with the modern handycam technique popularised by Blair Witch. And an actor who has played a zombie has yet to clinch an Academy Award. Within the genre you also need to consider the type of locations and the number of characters. Props and costumes should ideally be contemporary. The cheapest film would entirely revolve two or three characters in a present day living room (such as Hitchcock’s Rear Window, or Twelve Angry Men) –which is where a good story comes in. It’s going to have to be good if that’s all you have! And by all means stay away from anything involving water, if budget blow-outs Waterworld and Titanic are anything to go by. The key is to use what you’ve got, not what you’ve not. Rather than dream up some epic sequence involving hundreds of fantasy warriors battling on some distant planet, stories that revolve around what you have easy access to but maybe take for granted will be a lot cheaper and will ring true on film. Not only will you find it easier to write, as you will know what you are writing about, but your uncle’s prized Cadillac or your friend’s shop will introduce tremendous production values –and you haven’t even spent a penny!